"Beer can recipe using ranch dressing as a basting sauce. Really moist chicken. Drink half the can of beer and use the remainder for the recipe. It's summer, enjoy! You might even have time for another beer." Preheat grill for low heat and lightly oil the grate. 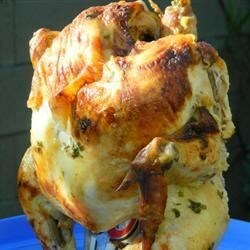 Place beer can on a disposable aluminum baking sheet and set chicken upright onto the can, inserting can into cavity. Mix ranch salad dressing, onion, garlic salt, salt, and ground black pepper in a bowl. Paint the outside of chicken with ranch dressing mixture. Place chicken on the baking sheet on the preheated grill. As the chicken roasts, paint the skin several times with the ranch dressing mixture. Cook until an instant-read thermometer inserted into the thickest part of a thigh, not touching bone, reads 180 degrees F (80 degrees C), about 3 hours. The nutrition data for this recipe includes the full amount of the ranch dressing mixture. The actual amount consumed will vary. Loved it! Moist and delicious! My wife added some other herbs to the glaze and I added some garlic pepper and salt and pepper in the beer. Even my picky kids loved it and we're asking for more.